Klein, Texas – The public is invited to join us this week for the 50th Annual Klein ISD FFA Livestock and Project Show to see more than four hundred thirty (430) students exhibit a variety of livestock including steers, heifers, lambs, goats, rabbits, chickens, turkeys and swine. Students will also show non-livestock projects such as horticulture, agriculture mechanics and scientific investigations. A floral design competition will be held on Friday. “The four-day event is a demonstration of how hard work and commitment pay off,” says the Director of Klein ISD’s Career & Technical Education Programs, Deborah Bronner-Westerduin. “Students dedicate countless hours, both in and out of the classroom, to care for and develop their projects.” In addition to academic content, the Agriscience course curriculum, in partnership with the FFA, emphasizes soft skills such as leadership, responsibility, dedication and the ability to work with others. Student exhibitor proceeds go toward college funds and purchase of next year’s projects. 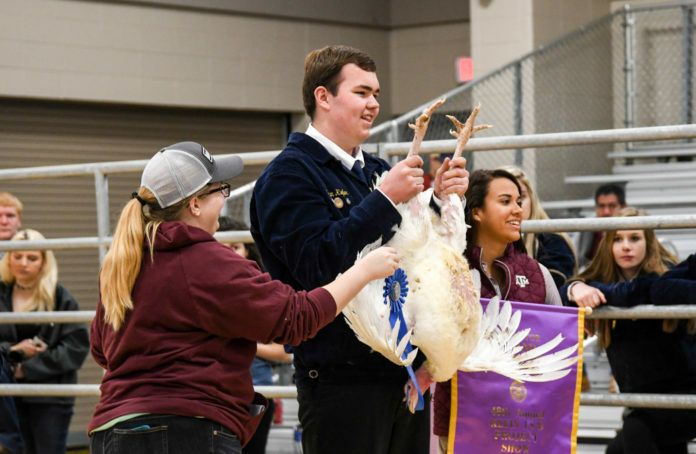 “I think the most important part of the Klein ISD FFA Livestock & Project Show is that students learn responsibility and the economics of raising that plant or animal,” says Dennis Pierce, Klein ISD Career & Technical Education Program Coordinator. The nearly (900) projects will be exhibited during this week’s Show at the Klein ISD Multipurpose Center, 7500 FM 2920, Klein, Texas 77379. • Add monetary amounts to the sale of student projects. • Purchase student projects that do not make the auction. If you have questions about buyer or sponsorship options, please visit the Klein ISD FFA Livestock & Project Show website at www.kleinisdffalivestockshow.net. Buyer registration is also available on Saturday prior to the Auction.